The diode protects the 3.3V side of the circuit from the higher 5V side by being reverse biased. 0V from the high voltage side forward biases the diode through the pullup resistor and gives ~0.3V at the low voltage side which should register as a logic low on mosts microcontrollers. 5V from the high voltage side reverse biases the diode. The low voltage side remains at 3.3V from the pullup resistor. This circuit is NOT suitable for I2C or SPI communication as the 3.3V (low) side cannot pull down the 5V (high) side. 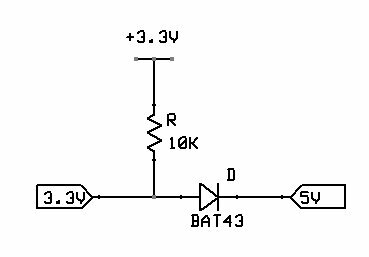 This is a useful circuit for straighforward logic level conversion so long as the 5V high side of the circuit can accept the limitations of a logic level of 3V for high. This is easily within the logic level parameters of most microcontrollers.